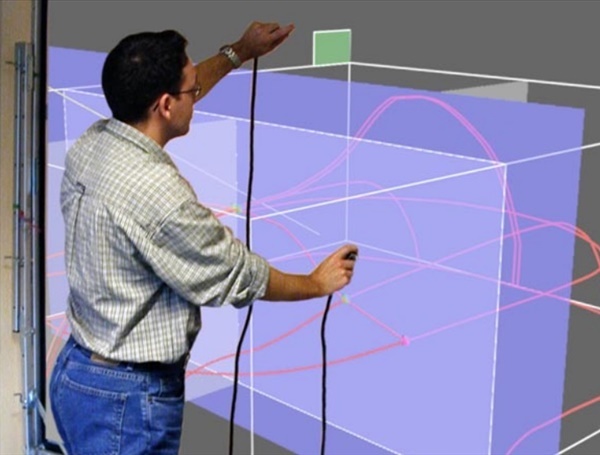 Previous systems have explored the challenges of designing an interface for automotive styling which combine the metaphor of 2D drawing using physical tape with the simultaneous creation and management of a corresponding virtual 3D model. These systems have been limited to only 2D planar curves while typically the principal characteristic curves of an automotive design are three dimensional and non-planar. We present a system which addresses this limitation. Our system allows a designer to construct these non-planar 3D curves by drawing a series of 2D curves using the 2D tape drawing technique and interaction style. These results are generally applicable to the interface design of 3D modeling applications and also to the design of arm’s length interaction on large scale display systems.